Below are some of the many ways the community of All Saints Catholic School puts it's faith into action. Prayer is an integral part of the school day. Students begin each day with prayer as a school community over morning announcements. 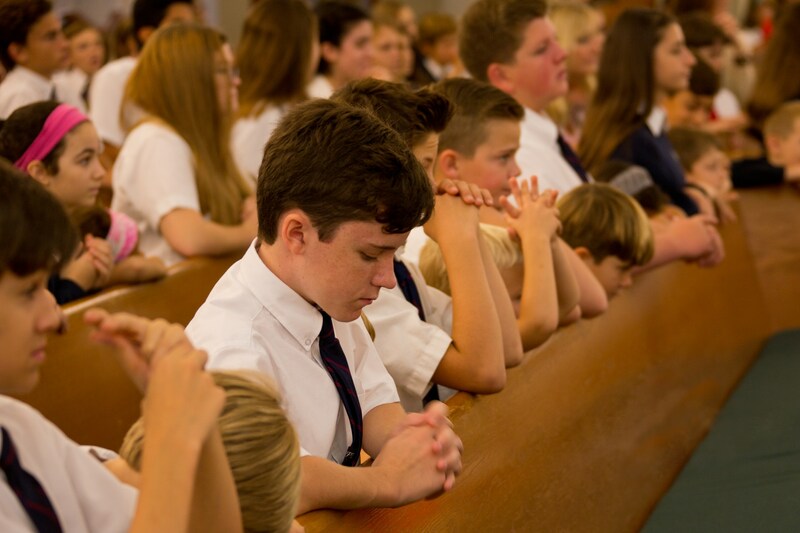 In addition, when students transition to other classes, they begin with a prayer. Prayer before and after meals is also included each day. A final prayer and blessing concludes each day. Prayer tables and special areas are designated in each classroom for prayer. At All Saints Catholic School we include in our Offertory a "Prayer Chalice for Vocations". Each week at our Liturgy the "Prayer Chalice" is passed to a new class. We pray that as we focus on praying for vocations to the Priesthood and Religious life, many young people will respond to God's call to serve our Church. Students attend weekly liturgy at St. Peter Catholic Church, including any Holy Days of Obligation and Ash Wednesday. Each week an individual class prepares the Liturgy. Students in grades 4-8 may participate as altar servers. Liturgy begins at 9:00 am each Thursday. Parents and family members are invited to attend. The weekly liturgy schedule will be posted soon. 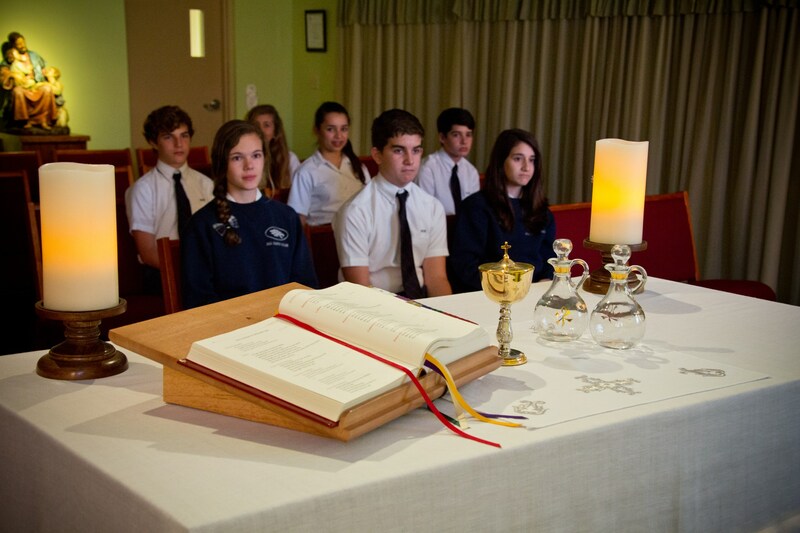 Students spend quiet time with Jesus during Adoration of the Blessed Sacrament on the First Thursday each month. Each class is scheduled for a specific time throughout the school day. For so many years the faculty, staff and children have longed to have on campus a quiet place for prayer and reflection while in the presence of the Holy Eucharist. On Tuesday, September 27th that dream has been fulfilled when Bishop Barbarito blessed our new All Saints and Angels' Chapel. So many faculty and staff as well as students worked in transforming Room 201 into a place for prayer. 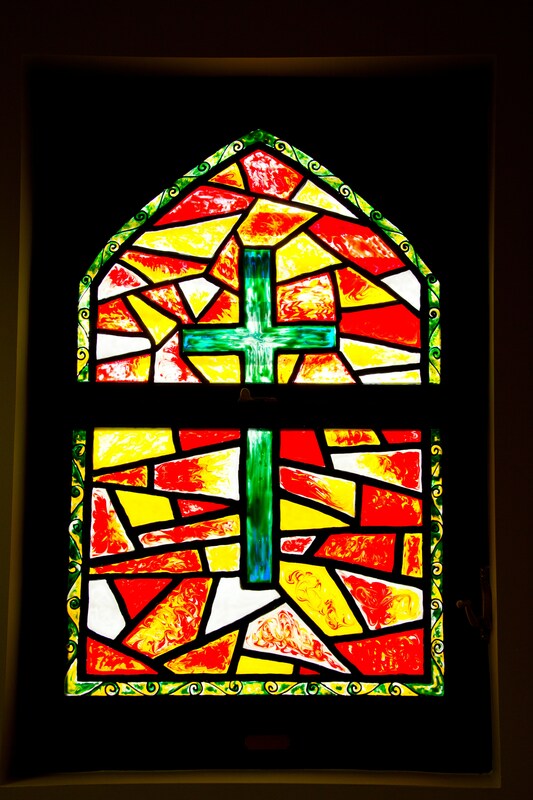 Our chapel is a creation of so many talented individuals. Mr. Jim Wallace built the altar, ambo and tabernacle table. Mrs. Betty Scherger sewed the draperies that line two walls, the Walsh family donated the new carpeting, the Gusmano family has purchased the church chairs, the Transue and Philipp families supported monetarily. 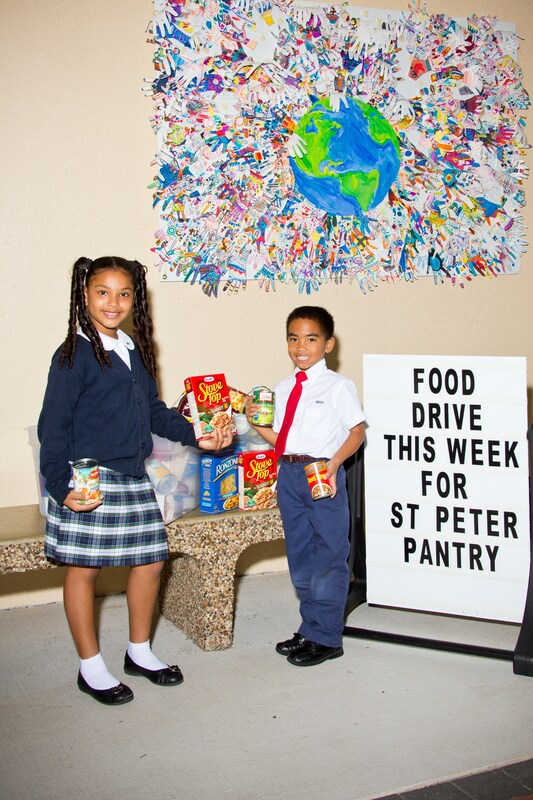 In addition, our six parishes have donated monetarily and resources to outfit our chapel. St. Jude's donated the tabernacle and monstrance, St. Peter's donated altar linens, chalice and paten, and St. Patrick has donated the altar stone and their CCW (Council of Catholic Women) are purchasing the Stations of the Cross. 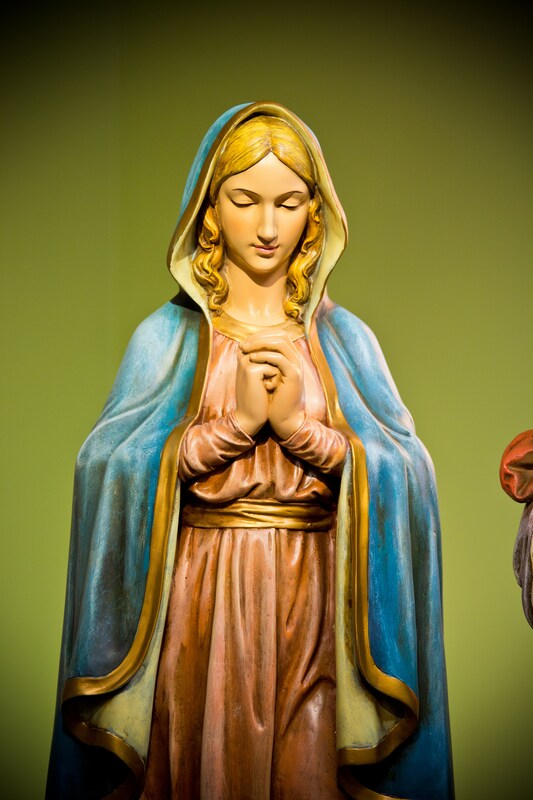 St. Paul of the Cross assisted monetarily and St. Ignatius contributed a statue of Mary and is purchasing a ciboria. Ms. Liz Philipp, Art Teacher, created the beautiful stained glass windows and staff and students all took part in painting each pane. Ms. Korf, Ms. Katie Philipp and Ms. Liz Philipp took the lead by organizing and supervising all the activities which have led to this day of celebration! Congratulations All Saints Catholic School; the Lord is truly in this place. Students participate in class and school-wide projects. 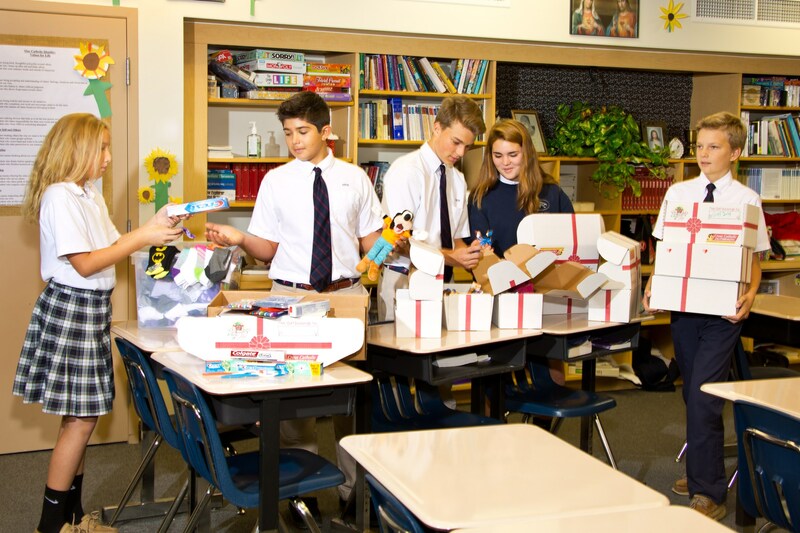 Some projects include, Box of Joy, Hurricane Relief Drive, Socktober, Parish Food Pantry Collection, Katie's Kovers, Food for Families, Pennies for Babies, Making Rosaries, and many others. Students in grades 6-8 are required to complete service hours each year. Eighth grade students completing 30 hours or more are eligible to receive recognition and a service cord at Graduation. We celebrate with Catholic School around the nation. Each day during Catholic Schools Week we recognize important people to our Catholic School community, such as family, grandparents, students, teachers, vocations, and soldiers. The celebration will be held January 27 - February 2, 2018. This year's theme will be "Catholic Schools: Learn. Serve. Lead. Succeed."